The US pop-punk band haven't released an album since 2011's Neighbourhoods but recently confirmed they are working on a new release. The band's Tom DeLonge revealed the group has high hopes for the record, saying: "This is going to be the one. "The one that we've been waiting for as artists, and the one that rewards all those people who saw potential in us." Asked how far along they are with the album, which is expected to be out next year, Tom said: "For me it's a lot of conceptualising, landscapes, textures and arrangements. I want to create a sound that's progressive and nostalgic at the same time. "We've been really fortunate that we've done a lot of different things so there are a lot of textures we've played with." 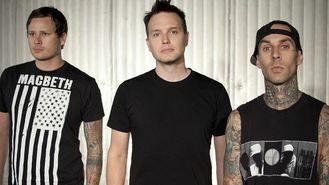 Blink-182 - made up of Tom and bandmates Travis Barker and Mark Hoppus - are also set to play at Leeds and Reading Festivals later in August, making it the second time they have headlined there. "The main thing is that these are the biggest, most revered festivals for rock and roll in the world. Because of that, if you're asked to play it, you don't say no," said Tom, 38. Singer and guitarist Tom said the band would be sticking with what they do best at the festival, rather than trying something different. "You don't want to be trying something new in front of 100,000 people, or whatever it is. If something's going to go wrong, it'll be then," he said.